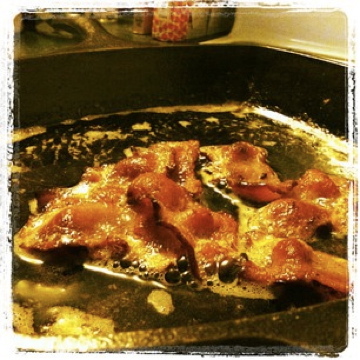 It was a bacon-y kind of night at our house. The afternoon sun hits our living room just right, and when I sit down on our dog-pawed and dusty leather couch, I can extend my legs into the spot warmed by sunshine. I did this today. Eventually I had to get up and do what I do whenever I’m feeling the slightest bit overwhelmed: breakfast for supper. My diet has been restricted for awhile now, so I know how to find uncured (no preservatives, artificial flavorings, etc.) bacon, but I stumbled onto the best. Trader Joe’s ‘W’ brand uncured bacon is one of the best things I’ve eaten all year. I had time to kill (read: hash browns in the oven) so I got my cast iron frying pan nice and warm and let the bacon cook gently (it can be done) for a really long time. It probably took about 15-20 minutes per batch. The end result was thick, deeply browned slices of bacon that were to bacon what al dente is to pasta. Not the crispy-break-your-teeth hard of the regular bacon. I gained approximately 80 lbs during my pregnancy with Colby by eating pounds and pounds and pounds of ribs, so this felt like an old, comfy food sweatshirt. Really. You should see how much I ate before he came down the stairs. I’ve already wrapped up a little paper towel covered bundle to make tomato and bacon sandwiches out of tomorrow. This was so much better than traditionally cured bacon that I’m already thinking of my next move. Who knows a good butcher? Good night, all. Sleep tight.